"Would a worm go on a walk, if you could lead him down the street? / Would he wear his tiny tennies, if he had two worm-sized feet?" So begins this humorous and imaginative picture book that introduces children to the idea that animals are uniquely created by a loving and wise God. 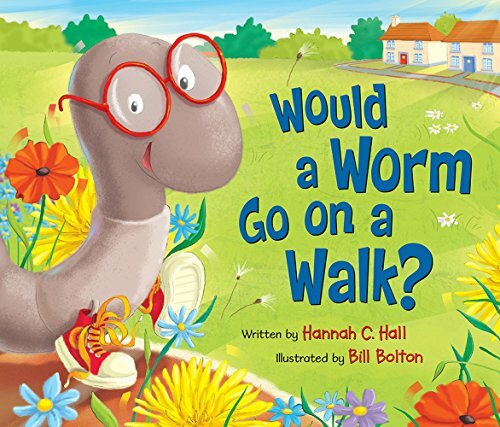 Would a Worm Go on a Walk?, with its colorful, comical illustrations, is a fresh, fun way to teach young children that God created all things very good. He gave all the animals, and children, too, wonderful qualities and unique strengths. Children will giggle over the ridiculous scenarios presented, and they will come away withdraw the knowledge that we all are loved and special. What a priceless children's book! I'm so in love with the absolutely adorable animals, the rhymes, and the affirmation of God's purposeful and perfect creation. With no holds barred, I recommend that you find a copy at the library or from your favorite book vendor and enjoy this colorful, creative, Christian story with your favorite little one (or a brood of them). This would make a wonderful addition to your churches toddler's ministry. I received a review copy from the blogger review group First Look (Worthy Publishing) in exchange for my honest and unbiased review. Hannah C. Hall is a bestselling author, award-winning blogger, lover of Jesus, lover of Josh, mother of four, cooker of meals, changer of diapers, and an unashamed enjoyer of desserts. Bill Bolton is a British illustrator and a graduate of Oxford Brookes University, after which he spent several years working exclusively for two major greeting card publishers. Since then he has worked across the board illustrating children’s book, in Advertising, Editorial, Publishing and Design. Bolton has a passion for the environment and lives in an earth sheltered house. At the weekends you might spot him under the wind turbine or mowing the roof.